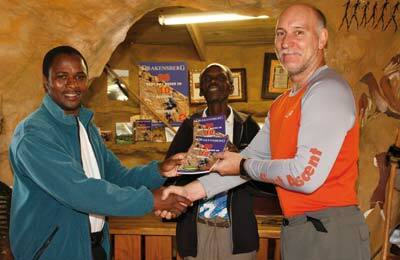 OSHANA recently launched their latest publication in the Mnweni region of the KwaZulu-Natal Drakensberg. OSHANA Publishing & Photography has recently launched their latest publication, "DRAKENSBERG - 20 Best Day Hikes In 10 Regions" in the Mnweni region of the KwaZulu-Natal Drakensberg. The Mnweni Cultural & Hiking Centre, under management of Agrippa Zondo and Zacharia Dlamini, played a vital role in the documenting of day-hikes in this area. OSHANA has also donated twenty copies of the hiking guide to the Centre as an initiative to raise funds to buy basic hiking equipment for the Centre's guides. From left to right: Agrippa Zondo, Zacharia Dlamini and Erwin Niemand.